Thanks for watching guys! appreciate it...enjoy! #1 you have a historical mistake: captain America's shield is made of vibranium, -Almost- anything can't get through or scrape that babe! #2 Thor's hand: you messed up the fingers a bit, try making them less pointy.#3 You need to make Iron man's arms a bit smaller#4 another thing on Thor, his left calf is too big. You forgot the hulk. The criss-crossing on Thor's armor could use a little attention, such as definition on the bottom, and shading were the muscle is. That's all I wana tell you, you've almost perfected your technique, you just have to slow down, take your time and enjoy It, you know. 63 out of 86 deviants thought this was fair. Wow! when i had first saw this I thought it was a picture of three cosplayers!! What kind of paint is made of bullet-proof adamantium? Aside from some small flaws you did an awesome job! DUDE!!! 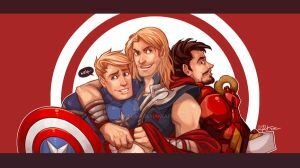 my 3 favorite avengers!! how long did it take for you to complete the whole spread. You're forgetting that Thor's the God Of Thunder when he summons lightning his eyes turn complete white. the greatest ever!! awesome work boy!! Love their pose!! oh god the color is soooooooooooo great!! !